Membrane filtration is an efficient and widely used chemical separation and water purification technologies. Yet, the membrane technology suffers from drawbacks such as membrane fouling and inadequate removal of dissolved organic matters, especially for the emerging pollutants mentioned above. In their study, Zhang and his Ph.D. student, Wanyi Fu, utilized microwaves as the irradiation source to induce catalytic reactions on membrane surface and enhance pollutant degradation. In contrast to other irradiation such as UV or ultrasonication, microwave is able to pass through industrial membrane filtration housing and enable membrane surface reactions. This novel technique has been filed as a US patent and the research has been published in the Journal of Membrane Science recently. Zhang’s team is also exploring ways to scale up application of microwave-enhanced membrane filtration technology in drinking water treatment, wastewater treatment and landfill leachate treatment. With more studies, Zhang’s lab soon hopes to demonstrate the feasibility of microwave-enhanced membrane filtration outside the lab for point-of-use (POU) water treatment devices for safe drinking water. Zhang’s lab is now working on different types of reactive membrane systems: UV-based photocatalytic reactive membrane, electro-chemical membrane and microwave-enhanced membrane filtration, which demonstrate high potential for efficient removal of emerging pollutants and low-cost membrane operations. Wen Zhang is an associate professor of Newark College of Engineering in the Department of Civil and Environmental Engineering at New Jersey Institute of Technology. Wen is a licensed Professional Engineer (P.E.) registered in the States of New Jersey and Delaware. He is an American Academy of Environmental Engineers and Scientists (AAEES) Board Certified Environmental Engineer (BCEE). His Ph.D. research focused on the environmental fate and transport of engineered nanoparticles, biological interactions, as well as nanomaterial characterization at biological interfaces. 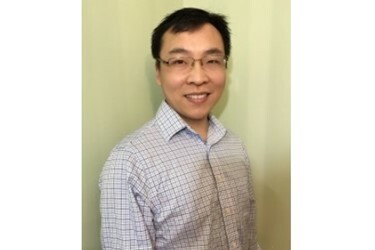 After joining NJIT, Dr. Zhang has been carrying out diverse research related to material interfaces and catalysis, including (1) Material characterization at nanoscale using hybrid atomic force microscope (AFM); (2) Environmental behavior and interfacial processes for nanomaterials; (3) Novel catalytic processes for harnessing renewable energy and pollutant degradation; (4) Reactive magnetophoretic separation systems; (5) Reactive membrane filtration for emerging contaminant removal; (6) Colloidal properties and enviornmental/agricultural applications of reactive nanobubbles. For more information, visit www.wenresearch.com. Wanyi Fu is currently a Ph.D. candidate in the Department of Civil and Environmental Engineering at New Jersey Institute of Technology (NJIT) under the supervision of Dr. Wen Zhang, an associate professor at NJIT and licensed professional engineer. Wanyi received her B.S degree from Central South University in 2011 and M.S. degree from Tsinghua University in 2014. Wanyi Fu's research focuses on nanoscale characterization of polymeric membranes and novel antifouling membrane filtration technologies.